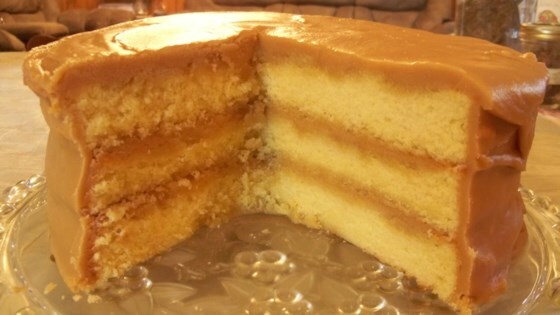 "Moist, delicious layer cake with caramel icing." Preheat oven to 350 degrees F (175 degrees C). Grease and flour three 9-inch cake pans. Cream white sugar, 1 1/2 cups butter, and eggs together in a bowl. Beat well. Combine flour, baking powder, and 1/4 teaspoon salt. Add to the sugar mixture alternately with milk. Add vanilla extract. Beat until batter makes ribbons when falling from the whisk or beater. Divide batter among the prepared cake pans. Bake in the preheated oven until a toothpick inserted in the center comes out clean, about 30 minutes. Cool layers on a rack before icing, at least 1 hour. Combine brown sugar, 1 cup butter, and 1/4 teaspoon salt in a saucepan over medium heat. Stir until brown sugar is dissolved, about 3 minutes. Add evaporated milk and continue stirring. Bring to a gentle boil and let bubble for about 4 minutes, stirring constantly to avoid sticking. Remove from heat and allow to cool, about 5 minutes. Mix confectioners' sugar and vanilla extract into the butter-milk mixture using an electric mixer until icing caramelizes and thickens to the desired consistency. Spread icing onto the cooled cake layers. Stack layers; ice top and sides. Great recipe. The icing came out perfectly.